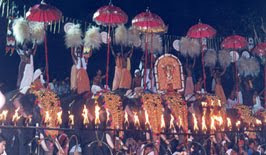 Kerala Tourism Development Corporation KTDC will webcast the 'Arattupuzha Pooram',in its official website www.keralatourism.org. This is the first time a temple festival is webcasted live online. The Sree Sastha temple is situated at Aarattupuzha, located 15km away from Thrissur town near Kodungallur.